This record-breaking Stephen Chow comedy was released in the UK only 10 days after its Chinese release. Sony released the film taking advantage (presumably) of the new strategy devised by Asia Releasing which gets new Chinese films into cinemas in cities with a sizeable Chinese diaspora population. Mermaid opened on 19 screens in the UK. This release strategy is similar to that of the Bollywood distributors in the UK and Mermaid shares something with mainstream Hindi popular cinema in offering romance (with songs) and broad comedy alongside special effects and action. The massive success of the film is, however, due, I think, to jokes in the Mandarin dialogue (which I couldn’t catch) and a serious theme. This latter gave the film a Japanese feel for me. Mermaid‘s simple plot sees an extremely wealthy businessman Xuan Liu (Deng Chao) buying an area of coastal National Park for re-development and then entering into partnership with the dangerous Ruolan (Zhang Yuqi), a beautiful woman who expects Xuan’s attention but is interested mainly in money. Xuan’s plan is to use sonar devices to drive away all marine life away from ‘Green Gulf’ and then re-develop the area (or sell it for re-development at an inflated price). At a party to celebrate the new partnership, Xuan is approached by a young woman, Shan (Lin Yun) who everybody assumes is a dancer or a ‘goodtime girl’. Xuan is interested, even if only to spite Ruolan. What he doesn’t know is that Shan is a mermaid from the last surviving group of ‘merpeople’ in Green Gulf. She is the ‘honey’ in a trap designed to capture and kill Xuan and prevent the redevelopment. The rest of the plot flows from this premise. Will Xuan fall for Shan? Will she be party to his murder? Will Ruolan allow all this to happen? Will the mer community be wiped out etc.? You can guess the answers to these questions. I enjoyed the film and the central performances. Stephen Chow has appeared himself in previous blockbusters such as Kung Fu Hustle (HK 2004) but now he is limited to producing, writing and directing. Deng Chao and Lin Yun make a good couple and Zhang Yuqi is an excellent villainess. 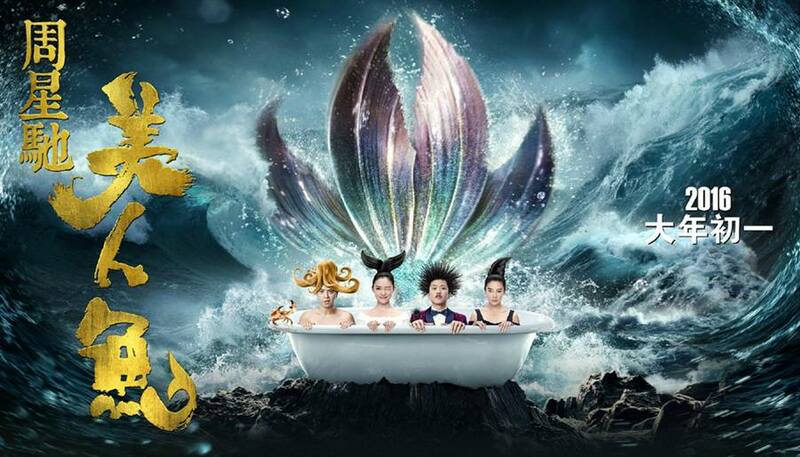 I thought that Show Luo, the well-known Taiwanese dancer, had a very interesting role as a merman who is half octopus/half man. Chow mined this character for some good comic material. The Japanese connection comes with both the ecological theme shared with Miyazaki’s Ponyo (Japan 2008) and the various documentaries about pollution in Japanese waters including The Cove (US 2009). I don’t know enough about critiques of pollution and narratives of ecological destruction in Chinese media to judge how unusual this is. I’m also intrigued by the strength of the anti-business message and wonder how this is being received in China. Unlike Hollywood blockbusters, this Chinese blockbusters seems to be ‘about’ something. This places it alongside other Japanese genre pictures such as the Godzilla films. Xuan Liu is quite a bit older than Shan and some reviewers feel this is an issue for the romance narrative. I should also point out that many reviewers criticise the CGI in the film. I never notice these things – they seemed to work fine. But perhaps evaluating effects is just a skill I don’t have? It’s far more important to have a good story and interesting characters. The role of Ruolan is played ‘straight’ by Zhang Yuqi. This is the better option, I think, than playing the villain as a comically evil character. Overall Stephen Chow makes the right decisions throughout the production.